KBS offers VTV executives a study tour on UHD broadcasting. 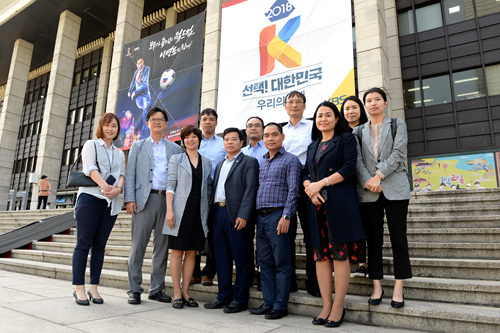 KBS has shared its world-class expertise and experience in Ultra High Definition(UHD) broadcasting technology with the national broadcaster of Vietnam. 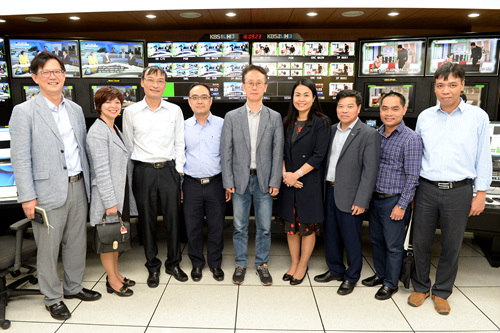 A seven-member VTV delegation led by Vice President Dinh Dac Vinh, mainly consisting of senior technical executives, visited KBS Headquarters on 30 May 2018 for an one-day benchmarking study tour to explore the KBS’ cutting-edge initiative to lead UHD broadcasting. As part of the study tour, KBS’ UHD specialists offered the VTV visitors a series of in-depth presentations on UHD service strategies planned by KBS. 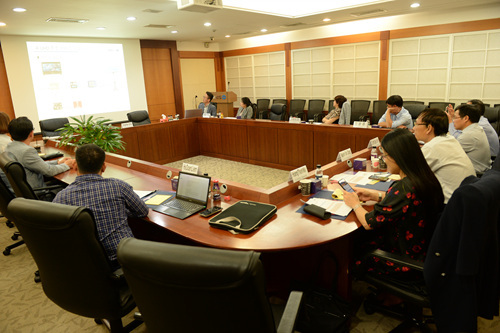 UHD Project Team Manager Lim Zung-kon is leading the UHD initiative and strategies for KBS and he began the working meeting with an overview of KBS’ development in UHD broadcasting. Also, Mr. Song hae-dong from KBS Sports Planning was invited to share KBS’ experience in the production of the International Signal in UHD during the PyeongChang 2018 Olympic Winter Games. Additionally, TV Transmission and Control Deputy Director Lee Byoung-ho joined the meeting for a session on KBS’ development in UHD transmission. VTV Vice President Dinh Dac Vinh said KBS and VTV have enjoyed strong friendship and co-operation for many years and he would like to strengthen the close relationship between the two organizations particularly in new media platforms. KBS International Relations Director Kim Young-sam welcomed the Vietnamese delegation on behalf of KBS and expressed his commitment to unwavering support and co-operation to VTV in sharing future strategies for digital broadcasting amid the ever-evolving media landscape. KBS has been investing in the future to serve as the next-generation broadcaster and media services provider, and launched the world’s first terrestrial 4K UHD broadcasting in May 2017. During the PyeongChang 2018 Olympic Winter Games, KBS brought the action to its audiences in UHD. KBS captured the biggest moments of the Winter Games across TV, radio and digital from the slopes and arenas in PyeongChang. Also, KBS unveiled its ambitious UHD documentary series project, Journey on Foot, in September 2017. Delivered in high quality full-scale UHD broadcasting service, Journey on Foot captures people of spiritual pilgrimage on three continents.